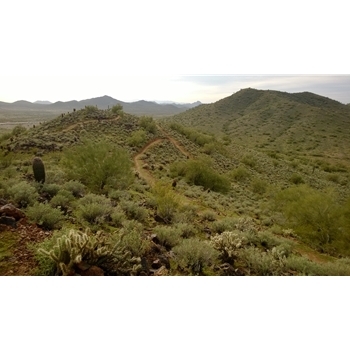 Located in the Sonoran Preserve North, this short loop takes you up and around the Apache Vista peak. Trail Description One of the newest preserves, this Sonoran Preserve trail system offers fresh trails and new trailheads. From the north-east end of the large parking lot, this loop starts out on the Sidewinder Trail. It slowly ascends to the Apache Vista turnoff, offering expansive views of the northern valley. After 0.86 miles, you will junction with the Apache Vista trail. Heading south, this will take you to the top of the peak in about 1/2 mile. From the top of the peak you will enjoy classic northern valley, 360 degree views. Heading back the same way, make a left and continue on the Sidewinder Trail for another 0.32 miles. At the Apache Wash junction, follow the wash back around the west side of the peak. After 0.4 miles, you will join with the Ocotillo Trail, which takes you back to the parking lot in another 0.35 miles. There are many other trails and loops in this trail system, so feel free to explore!